This is the simplest DIY saree method. You can transform a plain fabic into a beautiful designer saree by adding latest saree borders that are available in stores. Buy a plain saree fabric and choose a border that contrasts with the color of your saree. You may add this border to the sleeve of your blouse too. 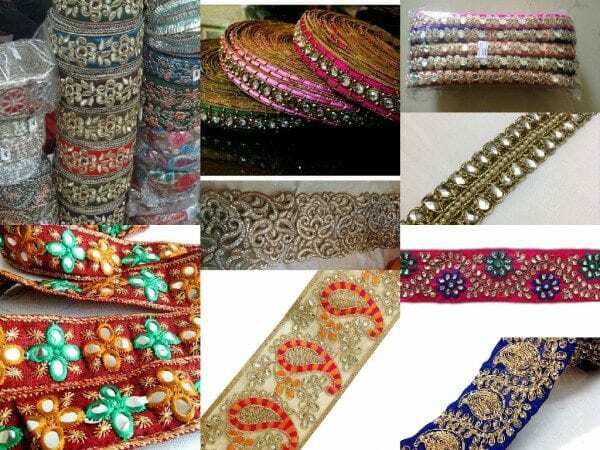 You can use a velvet border, silk border, wire work border, pearl border, kundan work border, mirror work border or anything that you like. A variety of lace and designer borders are available in local stores and online. 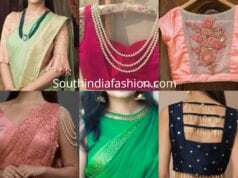 Another simple DIY saree method is to brighten a plain saree fabric with some embroidery or embellishments like zardosi work, mirror work or kundan work. 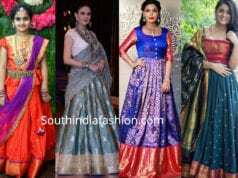 There are several ways to embellish your sarees. Readymade embroidery patches are also available in the market and these look really chic. Simply buy a plain saree fabric of your choice and glue kundans or mirrors or sequins along the saree borders or all over the saree. 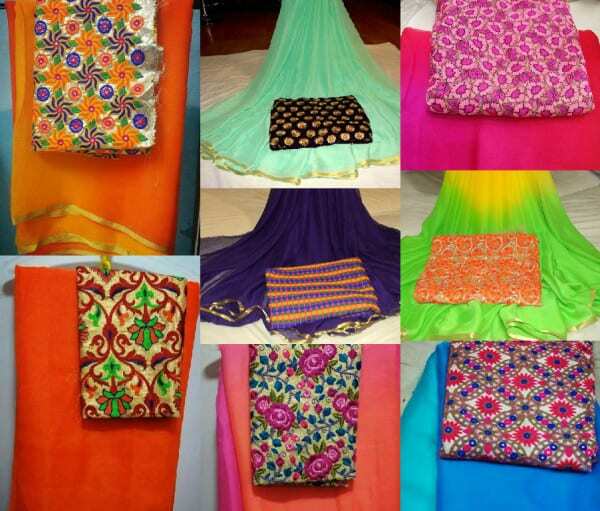 Your DIY designer saree is ready!! A Plain chiffon saree with Kundans glued to border and contrast orange piping is done. 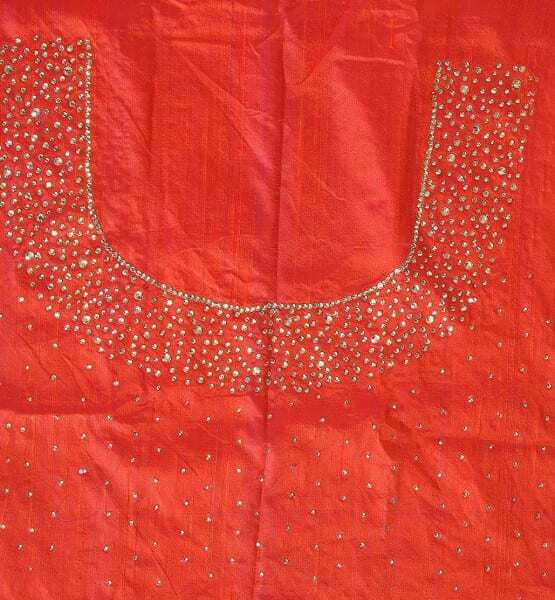 Same orange fabric is chosen as blouse piece and kundans glued all over. 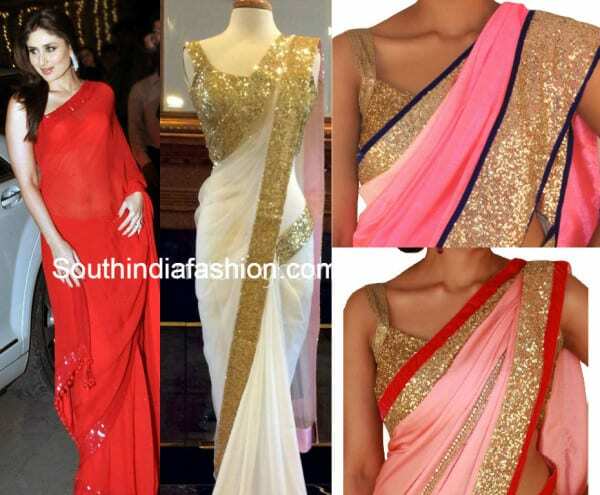 Any plain saree can be converted into a designer piece by adding a sequins border. You can also get a sequins blouse to go with this. Every woman should have a black, silver and a golden sequins blouse in her wardrobe. These can be paired with multiple sarees and they transform the look completely. Shanvi’s beautiful black sequin saree is easy to DIY. All you need is 6 yards of black plain fabric, black sequin fabric for border & blouse and a contrast red fabric for piping!! Now-a-days a variety of beautiful unstitched embroidered blouse pieces are available in the market. Pick your favorite blouse piece and pair it up with a contrast plain saree. A brocade blouse can do wonders to any saree. Just get a stylish brocade blouse to go with a plain saree and get all the attention! 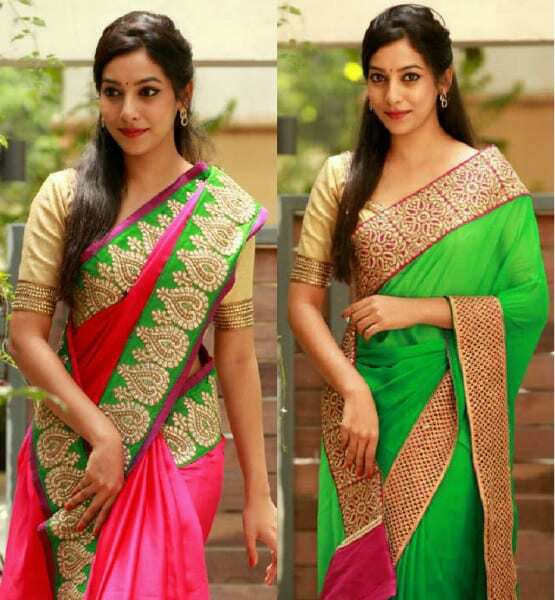 To design your own half and half sarees all you have to do is purchase two fabrics in different colors and patterns of your choice and get them stitched together. Add lace or sequins borders to make them look more beautiful. 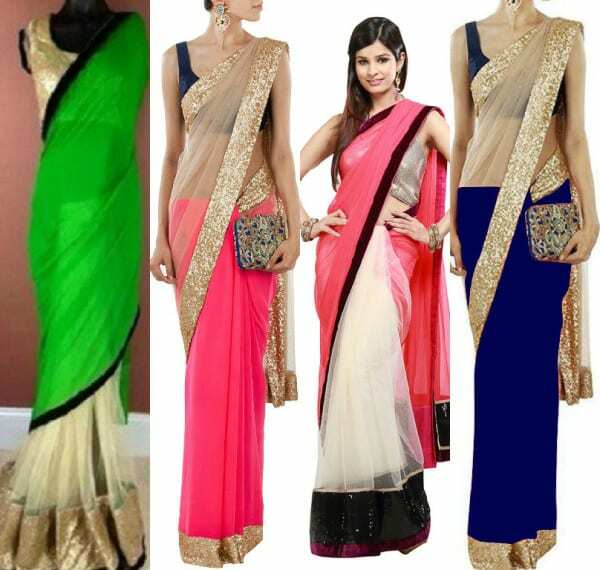 You can easily design your own sarees using one of the above methods. 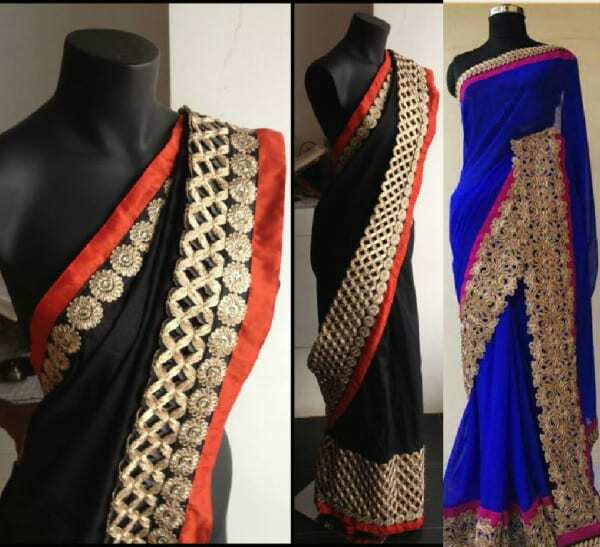 It’ll cost you much less than any designer labeled saree! 8 Simple And Easy DIY Methods To Convert Plain Blouse Into A Designer Blouse! Please help me how to order online . sarees are really awesome . Nice collection of sarees. Brocade blouses looks amazing..wonderful work. Completely agree with you! Adding a beautiful border will transfer your simple looking saree into a designer saree! Great work, thanks for sharing! So assume I designed a Saree which involves different types of materials, where give them for tailoring or a creation? I just need 1 Saree …do I still go to a factory? 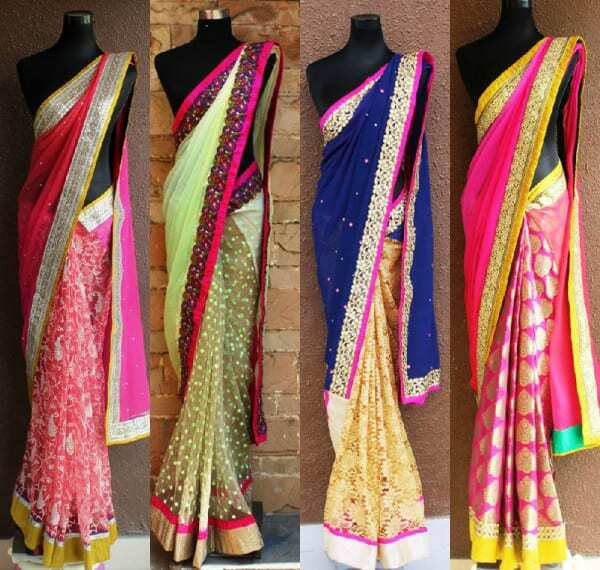 very beautiful..and all have done with a very wonderful work.from this collection i will design a saree for my sister marriage party.i like it very much. really ! 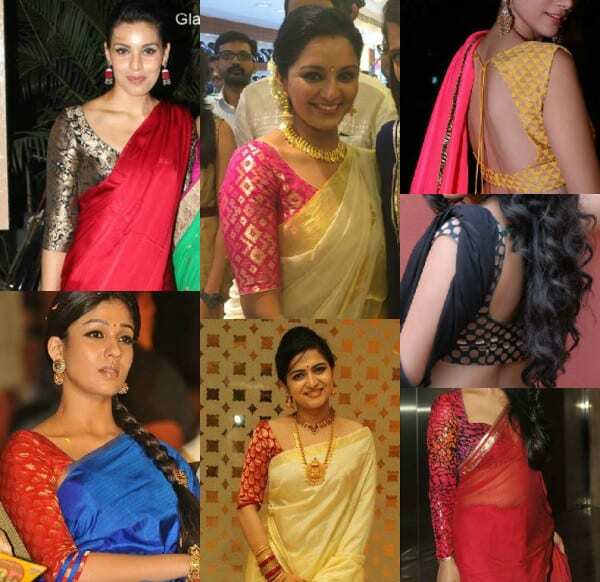 the borders looks quit attractive .And the idea of brocade blouse to any saree looks quite attractive. i like the collection . Is there anybody give training for this?? There is vast scope in Maharashtra. Please advise who can give training for DIY concepts?? Please call Aparna Kulkarni 9860212485 if any training facility/sources available.